GeoShred has been around in one form or another since 2015. It was developed by Wizdom Music the software company founded by keyboardist Jordan Rudess. 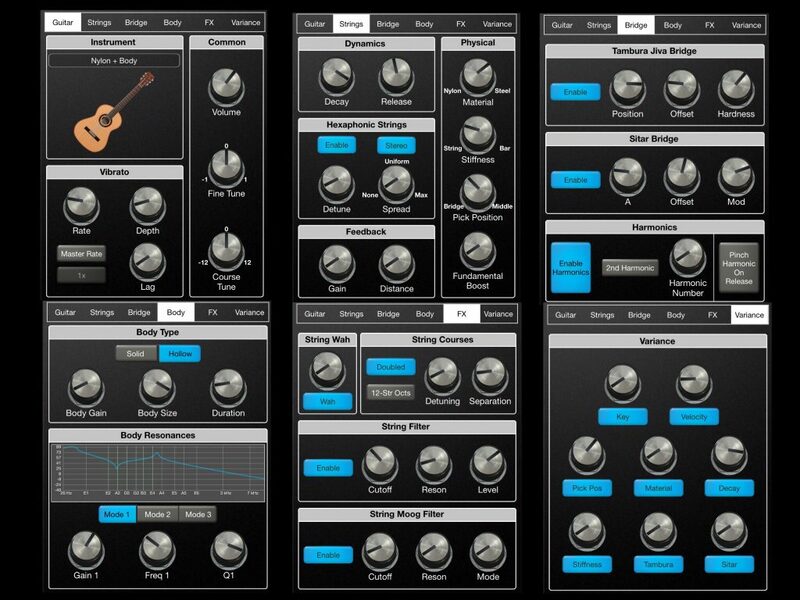 The latest iterations are GeoShred Play (which allows users to play preset sounds), GeoShred Control (a Midi/MPE controller for apps or hardware) and GeoShred Pro (which has all the features of the other versions and the ability to make your own sounds). The app works on iPhone or iPad. I am going to be taking a look at GeoShred Pro but the relevant parts of this article can be taken as applying to the particular aspects of the Play and Control versions. 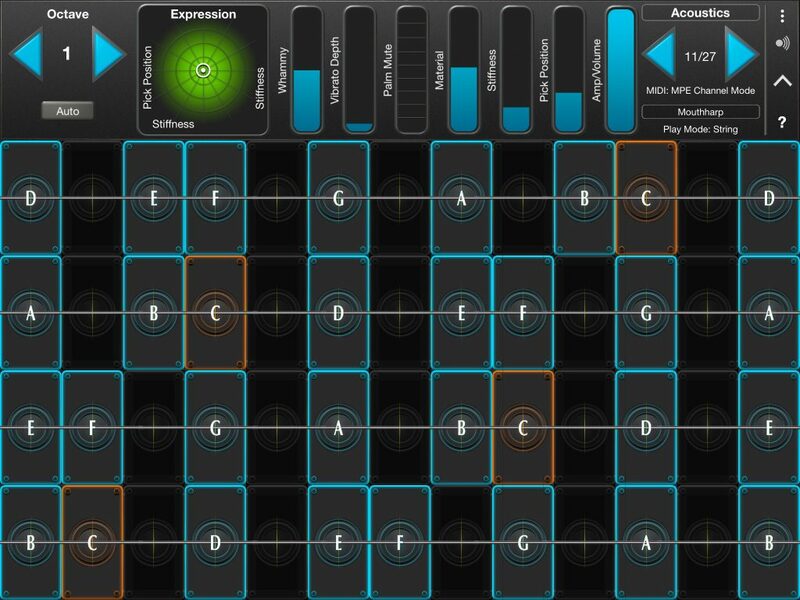 GeoShred’s user interface is unique both in the iOS app world and the wider context of musical hardware and controllers in general. The layout will be most familiar to guitarists as it is based on the strings and frets of a guitar. Instead of frets, each note is represented by a square or rectangle that has different expressive capabilities depending where and how it is pressed both initially and over time. 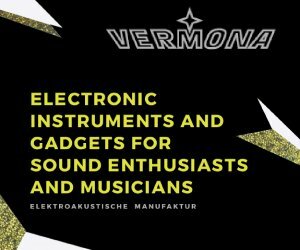 Depending on the preset you can slide between notes, add vibrato, feedback and effect a host of other sound parameters based on finger position and movement relative to the note area. A good example is using finger position within the note area to create a wah effect or volume pedal style guitar tones. The app also has an XY Expression Pad and various customizable vertical control bars that add further expression. The editing pages have knobs to adjust the various parameters. 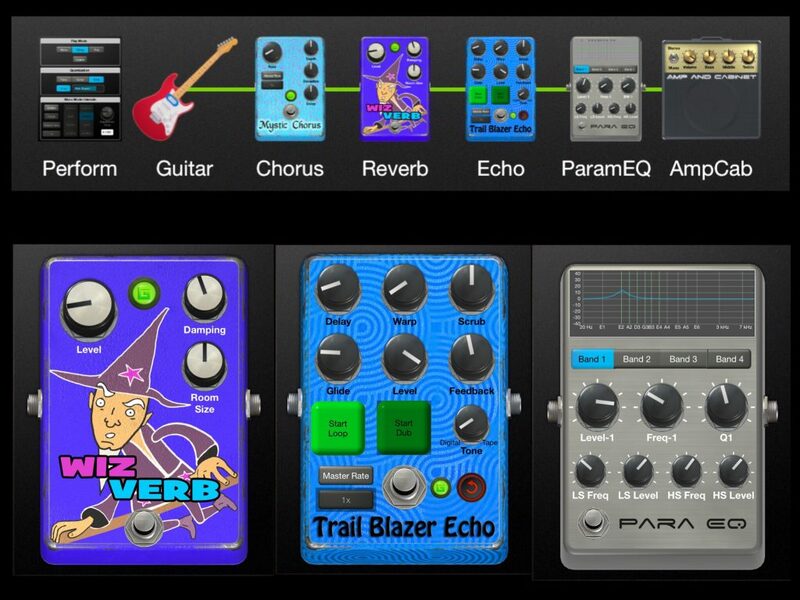 The effects section features some nicely designed control panels resembling guitar pedals and a drag and drop style signal path which allows easy reordering of your signal chain from the physically modeled sound to effects and amp modeling. The control surface at the top of the main screen also provides additional on-screen controllers for expressive flourishes while playing. The XY Expression Pad, guitar style “Whammy” bar and other modulation and on/off controls are fully customizable. 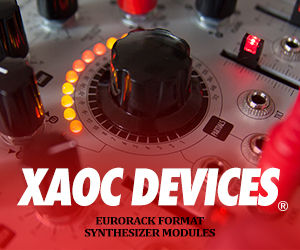 They can be linked to multiple parameters within the synth engine or effects with even the range and initial value able to be adjusted for each controller. GeoShred’s note areas are set up so the center is the perfect pitch and the area to left and right alter the pitch accordingly. What makes GeoShred both fun and effortlessly musical is the way that the sound engine is set up to trigger on and converge to the perfect (Center position) pitch no matter if you initially hit the note area in the middle or end a slide between notes exactly in the middle or not. Wobbling your finger within the note area has the same effect as applying vibrato to a guitar string. 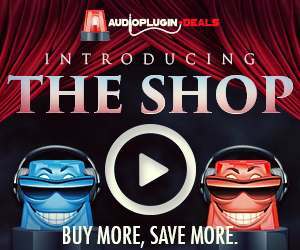 These note mechanics allow for a wide variety of expression that allow you to play synth sounds like a guitarist as well as play decent guitar and sitar type sounds. The synth engine in GeoShred is based on Physical Modeling Synthesis. This type of synth uses an algorithm that models the acoustics and harmonics of a physical string. Sound editing is fairly straightforward. You can edit the physically modeled guitar type, strings, bridge, body, effects, variance and modeled amp and cabinet. The Physical Modeling Synthesis is based on the life work of Dr. Julius Smith at Stanford/CCRMA. Here’s a short video that highlights all the folks who contributed to the creation of the GeoShred Product. Although GeoShred is great for shredding it is also capable of more subtle playing. Styles and the sounds you can get out of it range from Hendrix like guitars through sitars and mellow synths, plucky arpeggios and tuned percussion. There are controls for various western and ethnic scales and for preset or custom arpeggios. Setting the arpeggio speed to zero will play the notes together allowing you to play one finger chords that can be shredded and bent as one. WHAT ON EARTH IS MPE? One of the unique aspects of GeoShred is that it can be used as an MPE/Midi controller (such as ROLI Seaboard Rise, Roger Linn’s Linnstrument, etc). MPE stands for Midi Polyphonic Expression. It differs from regular Midi in that each note can have full expression independent of what is happening with other notes. On a regular Midi keyboard if you apply pitch bend or use the modulation wheel this is applied to all notes being played. MPE allows for pitch bends and modulations per note. For example, you could hold a Bass note at a steady pitch while sliding from a high C to a middle C and simultaneously playing a G with vibrato. MPE also allows for aftertouch or channel pressure where the strength of your finger press after the note is held affects whatever parameter is assigned. On an iPhone 6s or above 3D touch allows for this functionality as well as initial velocity with GeoShred. Unfortunately, 3D touch is not a feature of iPad hardware yet. GeoShred Pro opens up a whole new level of expression for musicians with an iOS device at a fraction of the cost of a hardware MPE device. The absence of 3D Touch on iPad devices at present makes the app slightly more expressive on the smaller screen of an iPhone. My hope is that at some point Apple will add 3D Touch to iPads which will open them up to be fully capable MPE controllers. 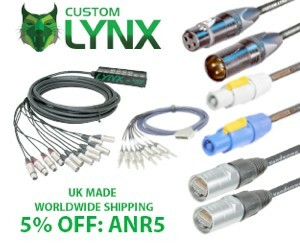 It is early days for MPE both in terms of available controllers and compatible software. Synth apps that support MPE are few and far between currently with Moog as the main early adopter with Animoog, Model 15 and Minimoog Model D – all having MPE. There are also apps by Roli (such as Noise) designed mainly to work with their Seaboard and Blocks controllers. Volt Synth by Numerical Audio (Kai Aras) is another welcome addition to the MPE family on iOS. GeoShred Pro is a uniquely expressive music app with a great sound. It is well designed, easy to use and most important of all is just hugely fun to play. Get GeoShred Pro on the App Store here.